72 photos of a trip behind a Kriegslok on this line in western Slovenia, from Jesenice, near Austria, to Nova Gorica, on the Italian border. Railways in the border areas of Austria (top), Italy (left) and Slovenia (right). When built these lines were all in the Austro-Hungarian empire until it collapsed in 1918. 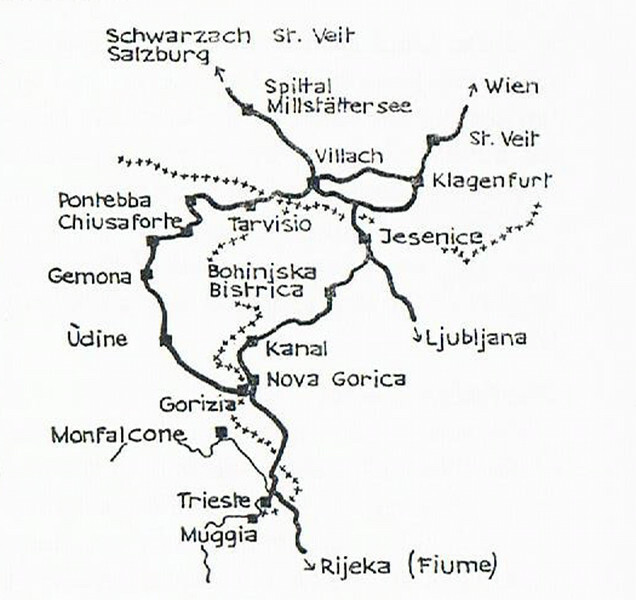 The Jesenice - Nova Gorica line was then divided between Yugoslavia and Italy until 1947, when the southern part transferred to Yugoslavia. As can be seen, the 96km line is now entirely in Slovenia. It was opened in 1906 to provide an additional route from Salzburg and Vienna (Wien) to the Adriatic port of Trieste, vital for land-locked Austria. Known as the Bohinj (Slovene) or Wocheiner (German) Rly, the single track, standard gauge line is now only lightly used and is not electrified.